The wilderness is the home to Mother Nature. If situation forces you to end up in the wilderness, you must try to conquer it. If you cannot take an experienced survivalist with you take the next thing- his stuff. These essential items should be able to keep you alive and comfortable. But stuffing everything you need in a small pack can be a daunting task. However, you cannot make it with right information and experience. Just 10 essential things can allow you to actually survive in the wilderness for close to two months. Amazing right? 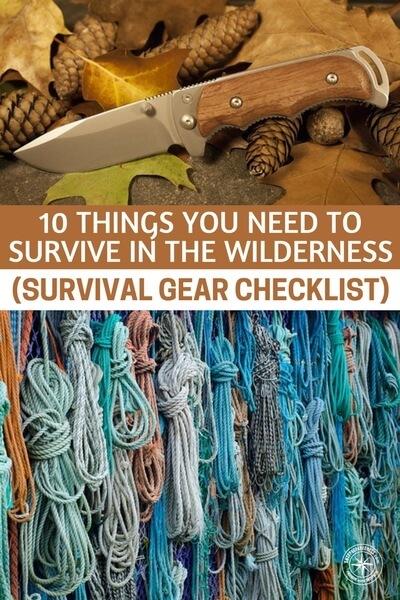 Well, here is a survival gear checklist you will need to survive in the wilderness. This list is in no way exhaustive. Feel free to change or replace any item to suit your specific needs. 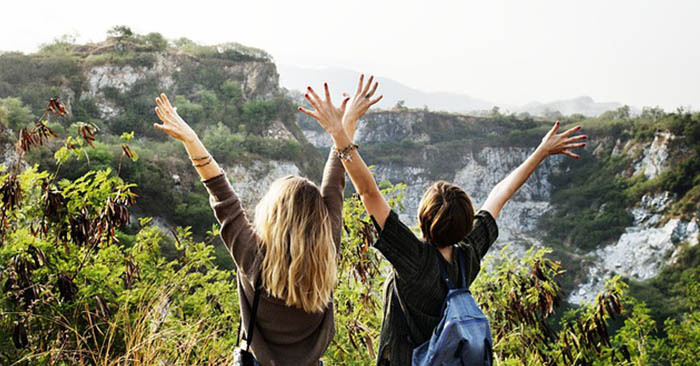 What is sure is that you will know the most vital stuff to pack as you gain more experience. You can then adjust as you deem fit. A survival knife or just any knife can prove life-saving in the wilderness. This item has so many applications in everyday camp activities as well as life in general. The versatility of a knife is why many people (me included) carry a pocket knife on them for everyday use. When it comes to survival, the ideal type of knife is a fixed blade. They tend to be more resilient and durable than folding knives. It is because they lack any mechanical parts that move. Besides, they can cut tree branches and other large objects. Experts say a physiological human should drink about 8-ounce glasses of water a day. Since over 70 percent of our bodies is water, doing three days without hydration is a recipe for disaster. Thus one of the things you need to survive in the wilderness is a water bottle or a hydration system. A water bottle or a hydration is great but it may carry only limited water. This is not good if you are not sure how long the emergency will last. On the other hand, a water purification system will help you make more clean water in the wilderness. You do not know when a disaster will strike. Therefore, you cannot be sure of the weather conditions that will prevail at the time. The situation is different if you planned for a survival trip. In the latter case, you can depend upon the meteorological department. They will tell you the weather focus for the future days. Anyway, a raincoat or rain jacket is vital. It is not a guarantee that they meteorological department is right at all time. Therefore, it is also important to carry a raincoat at all times. In case of rain, it will protect you from severe weather associated with such conditions. The summer heat can have serious effects on your skin. Thus sunburn is a real risk in the wilderness. A sunblock can be as simple as a lip balm with SPF. For instance, if you do not protect your lips from the scorching summer sun, it will burn and crust. Pack some sunscreen to protect your body from sunburn in order to protect your skin. Do you know exposure to severe ultraviolet rays from the sun for a long time can cause skin cancer? Stay safe even when in the wilderness. Any rope or cordage is as important as it can get when you are in a survival situation. The best cord, if you were to ask me is 550-parachute cord (paracord). It is one of the strongest cordages a survivor can ever get. Besides, it is very light and made to take the smallest space. You can simply wear it as a bracelet and pack an extra one for survival. Cordage will help you hoist food to keep it out reach of wild animals. You can also use it to build an emergency shelter or to make a splint for broken bones. An amazing property of 550- paracord is how it lengthens when wet. The property is great especially if you need a tight hold on a particular thing. If you go camping and an emergency ensues, a signaling device would be invaluable. This is because establishing contact in the wilderness may prove futile. A cell phone with service is not a survival situation. Thus, you will need alternative signaling equipment. A good signaling device is a flash from a signaling mirror. Such signal can be seen from miles away by aircraft and catch the pilot’s attention. You can then get quick help out of danger. It is better if you know how to flash S.O.S. Other great signaling devices are whistles, matches and lighter. Shelter-building equipment can be as simple as a large garbage bag or a tarp. In a survival situation, you must get a safe place to shelter your body from element and night. Only then can you stay warmer and drier. A simple way to build a shelter is to use a rope (or cordage), some tree branches and a tarp. It will take you very short time to build such shelter. Injuries such as minor to moderate cuts can heal much faster with the help of a First Aid Kit. Any dangling skin or gushing blood can complicate things. For instance, an open wound left for long can attract pathogenic agents. Such agents can cause nasty infections. A continuous gush of blood can lead to anemia due to blood loss. However, you do not have to go for a big, fully equipped First Aid Kits. Smaller versions are available for survivalists. In the least, a good kit should have bandages, gauze, hand gloves, alcohol cleaning wipes and OTC antibiotics. You can even improvise one to cut cost. At least one change of clothing is necessary for any survival situation. If the one you wear gets wet due to downpour, it is important that it dries. Severe moisture pulls a lot of heat from your body. This is because your body needs to focus the energy reserves on creating excess heat. such heat is necessary to compensate lost energy reserves. The result is fatigue and loss of brain performance. Wet socks and shoes will predispose you fungal infections of the toes and nails. Besides, you feed will tend to slide around. The result is a painful blister. You cannot go around the bush to gather supplies. These are good reasons for you to include extra socks. Also, remember to buy only synthetic clothing. Cotton will maintain wetness for too long. Where will you carry the essential items for you wilderness survival if not a good camping pack? Or you intend to cram them in your pocket? Obviously, that’s not possible because doing so will impede the movement of your legs. A camping pack can take more than the above 9 things you need to survive in the wilderness. It will allow you to carry other extras to make your survival more comfortable. Be careful not to pack too much as to impede your movement. Include those things you cannot do without first and other necessary items later. I could make the list longer by adding two things that can save your life. The first is a friend. The second thing is your brain. They are not strictly items but they are vital if you were to make it out of a survival situation. It is not possible to overemphasize the importance of an extra person. This way, you can keep each other from a hams way. Try to look for someone responsible, humanly and agile. For instance, how would you survive with a broken leg if no one is near enough to help you out? Your own brain is important because you may need to make smart decisions in a split second.